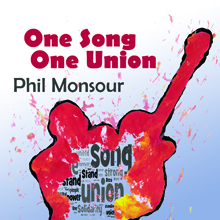 New album of contemporary trade union and solidarity songs featuring one song dedicated to each union. This album came to life on two picket lines. The first at the Brisbane waterfront. The shipping giant Hutchison fired half its workforce by text message. One More Day than Them is inspired by the Maritime Union’s fight for the workers. After 100 days of picketing they defiantly walked back through the gates! The second picket line at a children’s hospital – brave medical workers refused to discharge injured refugee child Asha into Australia’s infamous offshore detention prisons. Let Them Stay was written then. In a small victory, baby Asha and her family were allowed to remain, all be it, in community detention. This album reflects this trade union resistance, with a song dedicated to each participating union. For a year I met with them and wrote songs to capture their defiant spirit. Themes often overlapped: the fight for safe and fair conditions, decent wages, secure jobs and respect. I hope this collection can play a part, however small, in the fight for justice. Participating unions include the Maritime Union of Australia, the Electrical Trades Union, the Queensland Teachers’ Union, the Australian Manufacturing Workers’ Union, the Queensland Nurses and Midwives’ Union, United Voice and the Queensland Council of Unions. Phil Monsour: Vocals, Acoustic and Electric Guitars. Joe Panetta: Drums, Percussion, Bass, and Electric Guitar. Graham Perrett: Keyboards. Eddie Claxton and Ian Stenning: Trumpet and Flugelhorn. Kevin Skues: Trombone. Backing Vocals: Simon Monsour, Joe Panetta, Members of the Brisbane Combined Unions Choir: Kay Byrne, Marya McDonald, Annie Cowling, Denis Humes, Brian Prideaux, Denis Peel, David Tulip. Vicki Smyth, Janet Bailie, Annie Cowling (Better Work Better Life). Anna Dart, Ella Duncombe, Megan Thomson (Stand Together). Brass arrangements by Bryan Pearson and Graham Perrett.Insert photographs: Michael Oliver.Recorded by Joe Panetta. Additional recording Phil Monsour. Mixed and Mastered by Joe Panetta. Produced by Phil Monsour and Joe Panetta.